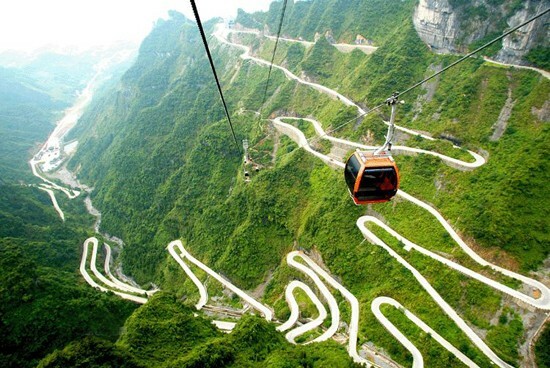 Tongtian Highway, located at the Tianmen Mountain National Forest Park in northwestern Hunan province, China, is a winding mountain road to the famous Tianmen Cave, which is located on the mountain peak. Measuring more than 10 kilometers (6.21 miles) in length and 200 meters (656.17 feet) to 1,200 meters (3,937 feet) above sea level, the road has 99 sharp turns. It took eight years and about 100 million yuan(US$16.2 million) to construct the road.The Tongtian Highway is known as the "First wonder of China's highways." Trollstigen means "The Trolls Ladder" in Norwegian. The road comes in the world dangerous roads' list because of its narrow and sharp bends. Located in the southwest part of Norway, it has 11 sharp turns at 2,800 feet above sea level, with an average slope of 9 degrees. Due to its sharp bends vehicles are no longer allowed on the road. Italy's Stelvio pass is located at the east of the Alps, near the Swiss border.The road is risky because of its 48 sharp turns at 9,045 feet above sea level. It is known as one of the longest winding roads in the country. Although there are no high cliffs along the road, people are advised to drive slowly. The Guoliang Tunnel Road was built in the Taihang Mountains of China's Henan province by 13 neighboring villages. It took five years to complete, and a few villagers died, in accidents, during the construction. The road is 1.3 kilometers (0.81 miles) long, 12 feet wide and 15 feet high, which makes the road extremely scary. The tunnel has 30 windows that allow drivers to enjoy the spectacular view of the Taihang Mountain. The mountain is known as "the long corridor in cliffs." Situated at the base of Pakistan's 26,660-foot Nanga Parbat, the ninth highest mountain in the world, the Fairy Meadows is a picturesque destination. However, getting to this beautiful place is not an easy experience. A part of the trip involves one of the most dangerous roads of the world. It is only a 6-mile-long uneven gravel road, without any safety guardrail, that takes one hour to get through. The Los Caracoles Passis a road passing through the Andres Mountainsbetween Chile and Argentina.The road features countless hard switchbacks and hairpin's turns, without any safety guardrail. The road is covered by snow almost all year long, making the drive even more difficult. The Atlas Mountains Road was built between Marrakech and Ouarzazate in Morocco. The road has numerous twists and turns, providing a test of both skills and nerves for drivers. The 117-mile drive takes about four hours, but the magnificent view is worth seeing. The Col de Turini is a high mountain pass in the Alps in the Alpes-Maritimes department, in France, with anelevation of 5,200 feet. It is famous for the Monte Carlo Rally, which is held every January on the tight road with its many hairpin turns. The road is composed of 34 sharp turns and some straight ways, being regarded as one of the most charming roads in the world. However, it is probably not an ideal road for people who advocate"safety first." Measuring 414 miles, James Dalton Highway is a gravel road beginning at the Elliott highway, north of Fairbanks and ending at Deadhorse, near the Arctic Ocean. It was built as a supply road to support the Trans-Alaska Pipeline System in the 1970s. Trailers and tractors often use the road. There are no gas station or supermarket along the road, so it would be best to have a car equipped with extra fuel, food and other supplies. Bolivia's Old Yungas Road is the most dangerous road. It is better to call it "The Road of Death" because it has taken more than thousands of lives – between 200 and 300 every year. The road is extremely narrow and often wrapped by a fog and vapors. The road twists and turns for about 40 miles between La Paz and Coroico, offering no protection from the sheer cliffs. Its highest latitude reaches over 3,000 meters. While driving on this dangerous road, you must believe on your destiny rather than your driving skills. Fortunately, a brand new bypass was eventually built. If you want to have a glimpse of this death road, you could choose the new road; if you like teasing death, then there is always the old road.